How can an I get feedback on my reviews? 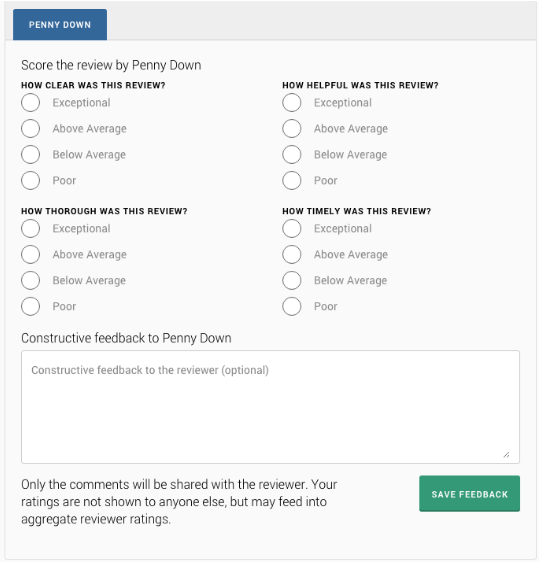 You can request an editor to provide you with feedback on the review progress page of the review in question. Find the review on your Review Records page and then click on your review's 'progress' column to get to the Review Progression Page. Simply enter your editor's name and email address and then hit 'invite' to send the request for feedback. Excellent reviews receive a gold star on the reviewer's profile and are an indicator of where reviewers have gone above and beyond. The only information made public is where a review is deemed "Excellent". NOTE: Scored reviews which do not meet the requirements for excellence will not be indicated on your profile or any other public part of the site. For more information about the "Excellent Reviews" feature, see our blog post.